Whether planning to celebrate a special occasion or just a quiet romantic evening, Mahmaan offers beautiful decor, friendly staff and the finest Indian cuisine to guarantee an evening to remember. 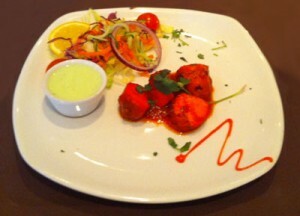 Small pieces of boneless chicken or lamb marinated in spices and yogurt and baked in a tandoor. Chicken tikka, cucumber, onions, potatoes and chickpeas in tangy sauce. Finished with spicy lemon dressing. Chicken marinated in yoghurt, aromatic spices and fresh herbs. 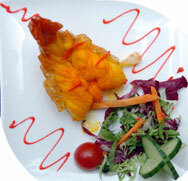 Barbecued in Tandoori served with salad and sauce. Crispy deep-fried, lightly spiced chicken in batter. Sweet & Sour chicken dish. Minced lamb marinated with fresh herbs and exotic spices, shaped into a sausage. Cooked on a skewer in the Tandoor Oven. Mince meat blended with our special mixture of spices and herbs, grilled and covered with an omlette. Lamb Tikka, Chicken Tikka & Seekh Kebab. Freshly cooked lamb, fairly hot and served on Puri. Minced lamb & spices wrapped in filo pastry. Chef’s own combination of meat and vegetable platter for 1 or 2 people. Sliced onions, mixed spices & gram flour. Fresh vegetable with selected condiments, wrapped in filo pastry. Dish made with spiced potatoes. Fresh mushrooms & spiced garlic cooked with butter. Soft Indian Cheese cooked with Indian Spices and Green Chillies. Crispy deep-fried, lightly spiced vegetables in batter. Soft India Cheese marinated in mint & spices, cooked in tandoor. Delicately spiced king prawn, deep fried in oil with breadcrumbs and egg. King Prawns cooked with medium spices garnished with spring onion and fresh coriander leaves, served with puffed fried bread.